In the mid-19th century, women worked at the Harvard College Observatory as "human computers," studying photographic plates of stars and unveiling some of the most fundamental discoveries of our universe. Astronomers at the observatory captured the images on these glass plates nightly. Women, with the job title "computers" in a pre-digital age, would then interpret the observations of their male counterparts and make vital calculations of the stars. Dava Sobel, author of "The Glass Universe." 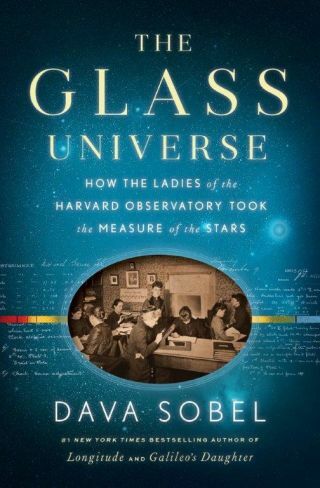 Space.com spoke with Sobel about her new book, how she came across the stories of the Harvard Observatory women and what it was like to see the observatory's original glass plates. "The Glass Universe" will be available for purchase beginning Dec. 6. Space.com: How did you discover the Harvard College Observatory women's stories? Dava Sobel: I first heard about [the women] from Wendy Freedman. At the time, she was with the Carnegie Observatory, where she was the head of the Hubble telescope project to determine the expansion rate of the universe. I was interviewing her for a profile in Omni magazine, and she mentioned Henrietta Swan Leavitt, who was very important to her work [at Carnegie]. I had never heard of Henrietta Leavitt; but her story interested me, and I thought I might write something about her. I later found out she was one of several women at the Harvard Observatory, which was surprising. Space.com: Why do you think the stories of these women have largely gone untold before now? Sobel: I actually have several opinions about that. One is that their stories were just told at the time, and then forgotten. This is not a "chip on the shoulder" kind of story — these women really were recognized for what they did, in their own lifetime. The world is so full of accomplished people and information that it's impossible to keep everything at the forefront of people's attention. But the story of this group of women, doing the important things they did, just seemed too good to let go. Space.com: How did you gather all of the different stories you incorporate into the book? Sobel: A main part of my research took place at Harvard, where all of the glass-plate stacks are still stored. The glass plates are really beautiful and so historic; there is nothing else like them. In fact, the information captured in the glass plates was never fully tapped, so they are now being digitized as part of a project called PHAEDRA, which stands for Preserving Harvard's Early Data and Research in Astronomy. I also spent a lot of time going through files of each woman, one by one. There are hundreds of boxes [stored in Harvard's library] full of old diaries, notebooks and letters, as well as observatory logbooks — there were endless resources. In fact, the hard thing for me was realizing I was never going to be able to get through all of it. Space.com: How did you choose which information to include and which women to focus on? Sobel: That part was tough, because there were so many important characters. There were the main women in the story, but then there were also the men and a lot of other people pushing astronomy forward at the time. At first, I thought I would focus on one woman to carry the story. But there really was no one that carried it all the way through, so in the end, the story turned out to be about the glass plates. Space.com: Who are the women that you chose to spotlight in your story, and was there one who stood out from the rest? Sobel: I wrote about Williamina Fleming, Antonia Maury, Henrietta Leavitt, Annie Jump Cannon, Cecilia Payne, Anna Palmer Draper and Catherine Wolfe Bruce. I think they each stand out in different ways, and everyone's story was interwoven; one thing sort of built on another. Cecilia Payne probably made some of the most important discoveries surrounding the composition of stars, although you could argue that Henrietta Swan Leavitt's work was the most important because it's the basis for the astronomical distance scale. Space.com: Did you encounter any challenges during your research? Sobel: Getting through all the material was a challenge in itself. In my earlier books, I mostly wrote about earlier time periods, so there tended to be less material to work with. With "The Glass Universe," I had an abundance of material, and I really could not read every last paper of the [Observatory's] annals. I constantly had to make choices, and there was also a lot of science that I had to absorb. Space.com: How did you find a balance between describing the science and the women's stories? Sobel: I like to think of a particular person that I'm telling the story to when I'm working — who is the audience? In this case, my imagined audience was my daughter [age 35]. She is extremely interested in women's history, especially during this time period. However, I think it's safe to say she knows very little about astronomy. So that was my target; the astronomy would be explained and described so that she could follow it. Space.com: In your opinion, what impact did the women of the Harvard College Observatory have on the field of astronomy, and how are we benefiting from their work today? Sobel: By creating a system [for stellar classification], the women infiltrated every observatory in the world. Astronomers needed a common language for talking about the categories of stars, and the stellar classification system became that language, which we still use today. Their contributions also showed that women were suited for this type of work. Space.com: How did Edward Pickering, director of the Harvard College Observatory, empower the women "computers"? Sobel: He had the idea to bring photography into astronomy on a large scale, which was a bold ambition. Then, he entrusted the glass plates to the women: He gave them the work of interpretation and accepted their creation of the [stellar] classification system. Space.com: Can you describe some of the significant discoveries the Harvard women made? Sobel: Mrs. Fleming did a lot of the initial classification work and, in the course of that, discovered hundreds of variable stars. Ms. Maury looked at the nuances of spectral lines and, through that work, came up with a way to distinguish giant stars from dwarf stars. Henrietta Leavitt discovered a means for creating the distance scale. Cecilia Payne showed that differences observed in the spectra [wavelengths of light given off by a star] were really dependent on temperature — you could actually determine the temperature of stars based on the appearance of the spectra. Payne's doctoral thesis also argued that the stars consisted mostly of hydrogen — which now we know is true but, at the time, nobody expected. Space.com: Many of these early discoveries were not only founded by women, but also funded by women. Can you describe the significance of that? Sobel: That is one of the more surprising parts of the story. Anna Draper had been her husband's, Henry Draper, assistant, and they had rearranged their lives to devote themselves to astronomy. They were making revolutionary headway on photographing the spectra of the stars. So when her husband died at age 45, Mrs. Draper, who was an heiress and had a lot of money, felt she owed it to him to continue his work. Space.com: What message do you hope to send to readers? Sobel: I think "The Glass Universe" is an encouraging story for young women. It shows girls have been going into science for a long time and doing work to distinguish themselves and earn high honors, even a hundred years ago.